Does the book include actual images of the menus? Those would be really cool to look at. One of the things I like about looking through old issues of Cleveland Magazine and the like is seeing an ad or review and realizing that the restaurant was in the same location as someplace I frequent currently. I recall seeing copies not infrequently at the Two Dollar Rare Book Store. I've always passed it over, thinking it was yet another dated advertising tool. I'll have to take a look the next time I see a copy. Dated advertising tools are awesome! They tell the story of what the city was trying to push during various historic periods. 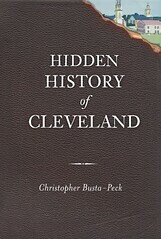 I bought a couple at the art museum book sale in 2008 - there was one from the 1940s that basically said, "you know what Cleveland should do? Increase public access to the waterfront." there was one from the 1940s that basically said, "you know what Cleveland should do? Increase public access to the waterfront." I'd love to hear more about this book, too. 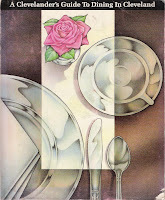 ahh, I have lived through meals at many of these places, both still present and now gone. Eating mostly as a vegetarian for nearly all of this time has been a challenge, especially on this particular list (although I stretch to seafood which made/makes eating out more possible). We are way better off now in terms of dining- I would never want to live in dining-out past!